Moong Dal Halwa is a classic recipe that is relished throughout Rajasthan. 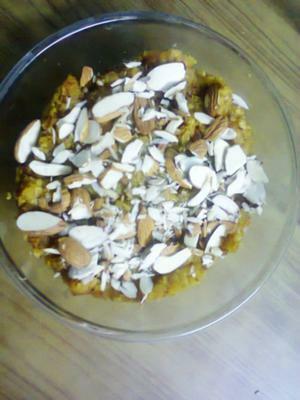 It is a popular Indian sweet often served in parties. It is super tasty and is often prepared during the winter months, as it is supposed to keep the body warm. 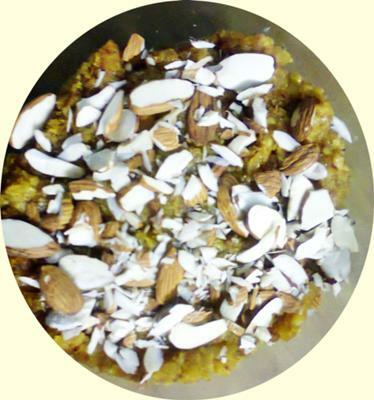 Made with Mung beans, ghee and dry fruits, this dessert is very common in the States of Uttar Pradesh and Rajasthan. It is considered to be auspicious for Holi and Diwali and on weddings occassions. It takes a long time and lots of patience to prepare this halwa and requires a little extra ghee too. The more we sauté moong dal, the more delicious will be the Halwa. You can make a larger quantity of this recipe and store it refrigerated for several weeks. Just add a little milk to the halwa before reheating it. This rich moong dal preparation is garnished with raisins and chopped nuts. 1) Wash thoroughly and soak the moong dal in plenty of water overnight. 3) Prepare a sugar syrup, add split cardamoms and keep it aside. 4) Add khoya to a nonstick pan. Stir it till it become golden brown. 6) Add khoya and mix it well. Cook for another 2 minutes. 7) Now add sugar syrup and mix well.Cook on medium flame for 5 minutes. 9) Garnish some almonds for decoration. Thank You God for this food which is set before us….. Please Ek baar chakh k dekho pata chal jayega.......Ki kaisi hoti hai panjab me Uttar bharat ki Mithasssssss.......Mung daal Halwa.........! 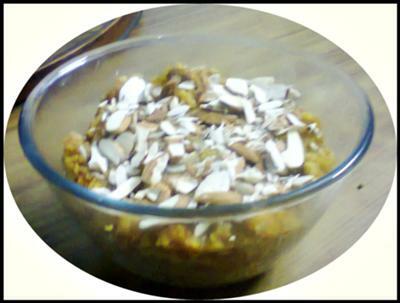 Unbelievable....u made this yummy desert..
Can't w8 ....crazy to taste it. One of my favorite Indian dishes! Yum, this is one of my absolute favorite Indian food dishes! Thank you so much for sharing with the group! Feel free to submit more excellent recipes Anytime!